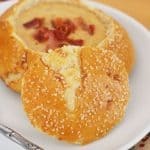 Cheddar Ale Soup in Soft Pretzel Bowls – homemade pretzel bowls filled with cheesy bacon beer soup! The best part is eating the bowl once the soup is all gone! I made pretzels again! Only this time I made bowls out of them and stuffed them full of the things pretzels go best with: cheese and beer! 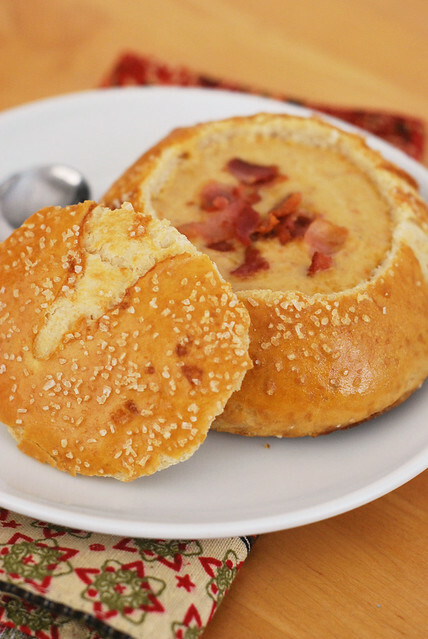 Cheddar Ale Soup in Soft Pretzel Bowls! Soft pretzels are actually really easy. If you can knead bread dough, you can make pretzels. Or if you have a stand mixer or bread machine that will do the work for you, even better! The only difference is that the dough is boiled with some baking soda before it goes in the oven. The baking soda is what causes the browned crust and makes it a pretzel instead of just regular bread. Oh my goodness, the soup. Is there anything better than a cheese soup?! And this one starts with bacon which makes it that much better! And uhh, beer. The beer is not super noticeable in the final product but make sure you use a beer that you’d enjoy drinking and not the Natural Light that your husband’s friends left in your fridge 3 months ago. The two put together were incredible! The cheesy soup seeped down into the pretzel and eating the bowl once I was done was the highlight of my day. Combine bread flour, 1 envelope yeast, 1 teaspoon salt, 1 teaspoon sugar, and water in large bowl (or stand mixer) and stir until dough comes together in a ball. Put on floured surface and knead for about 5 minutes or until the dough is elastic and smooth. Grease medium bowl. Add dough to bowl, turning to coat. Cover bowl with plastic wrap, then towel; let dough rise in warm draft-free area until doubled in volume, about 35 minutes. Flour baking sheet. Punch dough down and knead on lightly floured surface until smooth. Divide into 2 pieces. Form each dough piece into ball. Place dough balls on prepared sheet; cover with towel and let dough balls rise until almost doubled in volume, about 20 minutes. Preheat oven to 375F. Grease another baking sheet and sprinkle with cornmeal. Bring 8 cups water to boil in large saucepan. Add baking soda and 2 tablespoons sugar (water will foam up). Add 1 bowl and cook 30 seconds before flipping over and cooking for another 30 seconds. Using slotted spoon, transfer bowl to prepared sheet. Repeat with remaining bowl. Brush bowl with egg white glaze. Sprinkle rolls generously with coarse salt. Bake rolls until brown, about 25-30 minutes. Transfer to racks and cool until you can handle them. Use a sharp serrated knife to remove the tops of the bowls and hollow them out. In a 4 1/2-quart Dutch oven over medium-high heat, cook the bacon until crisp, about 8 minutes. Discard all but 2 tablespoons of the fat in the pot. Reduce the heat to medium. Add the onion, carrots and celery, cover and cook, stirring occasionally, until the vegetables are softened, about 20 minutes. Add the garlic and cook for 1 minute. Add the flour and cook, stirring occasionally, for 3 to 4 minutes. Add the ale and cook, stirring constantly, for 2 to 3 minutes. Add the Worcestershire, milk and broth, increase the heat to medium-high and bring to a simmer. Reduce the heat to medium-low and simmer for 10 to 12 minutes. Remove the pot from the heat and puree the soup with an immersion blender until smooth (or use a regular blender and do it in batches). Set the pot over medium-low heat and add the cheese by the handful, stirring constantly; do not allow the soup to boil. Taste to see if you need salt and pepper - remember that your pretzel bowls are heavily salted so go light on the salt in the soup. Ladle into pretzel bowls and top with extra bacon, if desired. 32 Responses to "Cheddar Ale Soup in Soft Pretzel Bowls"
Im not even exaggerating when I say I’ve been craving soft pretzels and cheese for MONTHS!!!!! This triggers emotions in me I won’t admit. But I think I did just shed a tear. You’re right, pretzels, beer, cheddar, they’re pretty much a perfect combo! 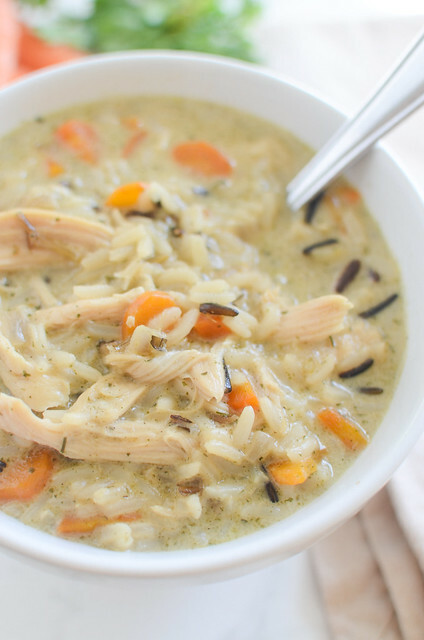 This is an awesome warm-me-up meal. Love those bowls! I’m with Julia- this is so amazing it just makes me want to cry. Oh. my. goodness. I need this in my life in a serious way!! I’ve been wanting to try bread bowls forever, but I’d never even considered pretzel bowls. Genius!!! I am literally salivating at my desk at work at 9:30 am. This looks unbelievably good. Weekend project! I’m being tortured and taunted by bread bowls for soup!!! I need to make some. I’ve wanted to for ages but never thought of how easy it might actually be. I’ll have to show this to BF. I’m pretty sure will be have me make it really soon. I love pretzel buns for burgers, and now I need these! Oh my…be still, my heart!!! This sounds absolutely incredible!! I just pinned it on my Recipes to Make board. I can’t wait to make it! Totally pinned this….making it as soon as I can. One of my favorite restaurants has a beer cheese soup and it’s amazing…this reminds me of it. Yum! Holy mother of all things good! My husband might propose again if I made this for him. 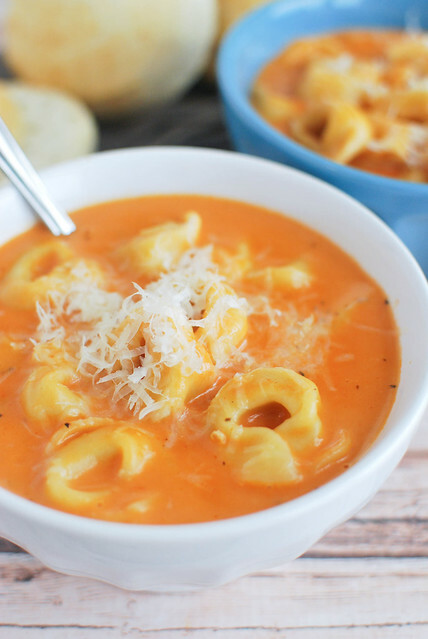 HE LOVES Cheddar Ale soup, and soft pretzels – amazing!! Holy cow – that made me move my face closer to the screen to get a whiff. Your best post ever. Pretzel rolls are basically…my most favorite carb on this earth. And cheese is pretty much a love also. This is awesome! This is brilliant! You have combined like 5 of my favorite things into one delicious looking meal. Cheese, pretzels, beer, soup, bread bowls! This is definitely happening. pretzel BOWLS? 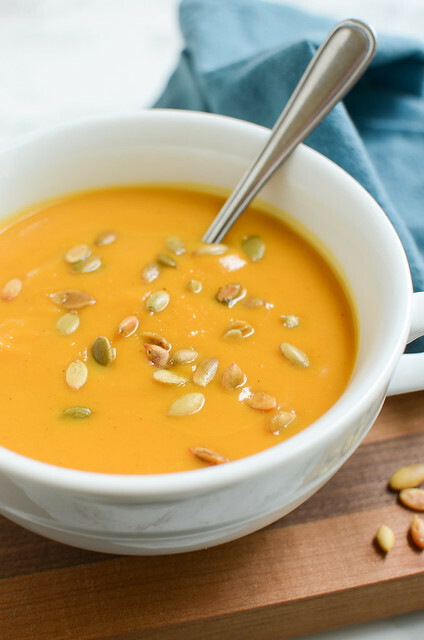 you just blew my mind!..and I can’t think of a more perfect soup to fill it with! YUM! I swear I would totally skarf (scarf?) this down. Oh my heaven, the bowl..the cheese. 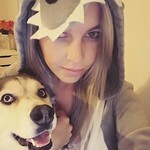 Seriously awesome girl. Yay, glad to hear it! And can I say that I’m jealous that your husband can actually cook something that isn’t pancakes or a piece of meat? :P Thanks for coming back to let me know! Haha, actually that’s one of the reasons he’s my forever-guy…we both love to cook , either together or for each other as a treat :) We got a good thing going on! I made this last night for a house-warming party and it was DELICIOUS!! Everyone loved it. Next time I make it I will add cubes of steamed potatoes to make baked potato soup! I can’t wait to do that. Thank so much for the amazing recipe. Oh.my.goodness.! I made this for dinner tonight (complete with the pretzel bowls, of course) and it was fantastic! 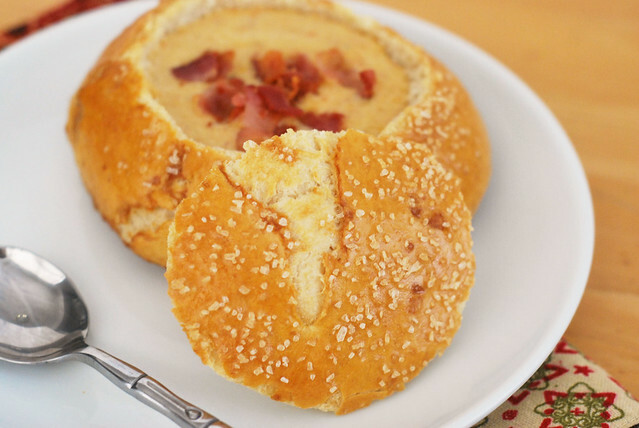 Between the soup, the pretzel bowl, and the crispy bacon, oh my! It’s all kinds of wonderful! The pretzel bowls turned out perfectly too! I will definitely be making this again. I’m looking forward to having some of the leftovers for lunch tomorrow. Thanks for a great recipe! I tried making the bread bowls tonight but my didn’t turn out nearly as pretty as yours did. Mine looked fine until I put them in the boiing water. At that point they deflated a little and flattened out considerably. Any suggestions on what might have gone wrong or how I can prevent this? My pretzels always deflate a bit when I put them in the boiling water. I tried looking up why but everything just said to “be really careful” when transferring the pretzels to the water. :( I’m sorry they didn’t work out for you and wish I could help more! Instead boiling my pretzels, I brush them with the soda wash and straight into the oven, so they don’t deflate. but I have to point out a miss spell! Those look amazing! Need to give those a try!